Martha preparing some healthy carrot juice with ginger. She was inspirational with her energy and vigor at 74! I must say that Doha knows how to throw a party for the world to come see. National Qatar Day (every December 18), National Sports Day (the second Tuesday in February), and a weeklong Food Festival in March to celebrate have been just a few events that we expats have enjoyed since moving here. In late March Doha opens three venues for a food festival, The Museum of Islamic Art, Katara and The Pearl, all located on the Persian Gulf Cornish. You can climb in a boat for a few dollars if you want to go to all the locations. 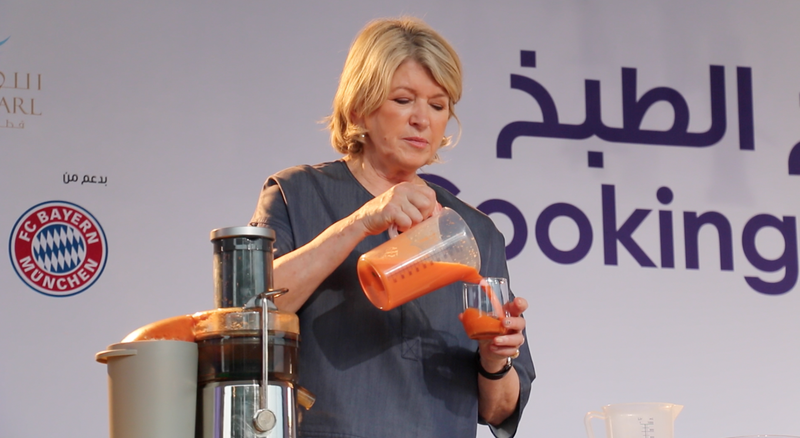 But we just went to The Museum of Islamic Art Park, and found plenty to do for one night--even a chance to see a Martha Stewart cooking show. "I love Martha, warts and all. " "You can work forever, and keep on being creative." Interestingly, one 19 year old young woman said, She has made a business of making our homes more beautiful. And although I know she has an army of people to help her, I am more motivated to make my surroundings more beautiful when I see what she has done." "Our food options are so much different than when her best selling book, Entertaining, came out in 1982. She has been a big part of that revolution." "It was great to hear her speak about her family and grandkids. You can tell she really likes being a grandma. I was impressed that her daughter is a vegetarian, and has not made the same dinner for five years." "I have to say she really knows her "stuff." Some of the things Martha taught day: "Feed your family good and healthy food. Work at it. Be mindful of what you are eating. Keep being intrigued on how to make meals interesting. When I started this business, we didn't eat such an international diet. For example, now quinoa, a Peruvian grain with lots of protein, is one of my favorite foods--not so 30 years ago. Keep learning from every source about how to be healthy. Celebrate with family and friends the big holidays and the daily dinners. All of the days tied together are important--not just the holidays. Grow herbs and vegetables. Share them with family and friends. Get some chickens. Chop food with three knives of the same size, (yes, three). Don't use a lot of paper towels. Use just one good rag. Compost, Recycle. Enjoy every season to the fullest." "Doing projects really gives people confidence. Nothing is better than taking the pie out of the oven. What it does for you personally, and for your family's idea of you, is something money cannot buy." "My dream now, in retrospect then, was to be an eclectic knowledge-gathering person--in order to be able to learn and then to teach. And I'm still doing that, so I think I am a teacher." "If you learn something every day, you can teach something new every day." Thanks, Martha. I never thought of you as a teacher, but I was inspired. I am glad we finally met.